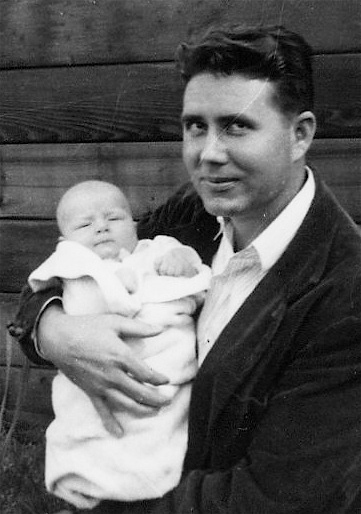 My father, Mac McCaughey, will tell a tale from when he was very small – far younger than he is in this photo to the right, which was probably snapped around 1953. Key words to learn before listening: covers, furry, snuggle, stray. Taking into account the four words above, what do you think this story will be about? 15 words have been removed from the written text. Listen and write them. Okay. When I was (1) __________ probably – and up till I was about twelve years old, I (2) __________ take a cat – any cat – to bed with me because they were nice and warm and (3) __________. And… I (4) __________ that when I was about twelve when I got a (5) __________ cat and got ringworms all over my (6) __________.